When a virus attacks the Nine-Nine's computer network, it sends out an email with everybody's search history. Jake prints the email and reads out loud the list of embarrassing searches his colleagues performed. When Jake receives a call at work, he and Boyle rush to Sal's Pizza to find it has burnt to the ground. When Fire Marshall Boone arrives, he and Jake are antagonistic to each other, both believing their service, police or fire, is the best. Fire Marshall Boone refuses to let the police officers Jake and Boyle onto the scene as it's under fire department jurisdiction. Back at the precinct, Holt congratulates Rosa ands Amy on their latest solved case, telling them to write up their paperwork right away. Back at their desks, Amy returns to looking at the search history email. When she wonders why Rosa was searching for property in Ropesburg, Rosa tells Amy that she was offered the job of Captain in the small, New Jersey town. Rosa says she turned the job down, but Amy still acts awkward about it. When Jake and Boyle arrive back at the precinct, they are determined to get access to Sal's Pizza to investigate for themselves. Boyle doesn't think it's worth starting a turf war with the fire department, but Jake does as Sal's is an institution and served the best pizza in the neighborhood. Boyle disagrees on the last point, believing Sal's is only eighth-best, as discussed in his weekly Brooklyn pizza-ranking email blast. 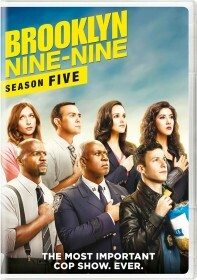 When Captain Holt goes to Terry's desk, Sergeant Jeffords introduces him to Corey Park, or "Savant", who was behind the virus on the precinct's network. Captain Holt instructs Terry and Gina to search for a new IT director. When Terry doesn't think Gina will be much help, Holt insists Gina has something to offer so Terry should use her skills. A pair of fire men arrive at the precinct with the case files for Jake and Boyle to investigate. When they open the files, it contains a squished donut. Jake is more determined than ever to solve this case, even if it's not their jurisdiction. Later, Jake and Boyle talk to Sal in the bull-pen. Sal says the fire men think he burned down his restaurant. Jake is sure Sal wouldn't burn down his own place. Sal tells them there's at least ten pizzerias that wanted him out of the game. Jake says he'll start interviewing Sal's competition to see if anything suspicious comes up, promising Sal he'll solve the case. Meanwhile, in the evidence room, Amy is making barbed comments wondering why the Ropesburg PD offer Rosa the job of captain. Jake and Boyle go to Mario's pizzeria. While Boyle tastes the pizza, Jake blames Mario for the fire at Sal's. Mario says he has an alibi. The pair then go to Gino's. Jake accuses Gino, but he too has an alibi. Jack and Boyle realize they're at a dead-end and need to check out the crime scene, even if they don't have permission. As Terry and Gina interview IT guys, Gina asks odd questions of the applicants and starts acting strangely. Gina attempts to scare one guy, then flosses in front of a female applicant. Meanwhile, Rosa goes to Amy's desk with an itemized list of what was stolen in their robbery case. When Amy points out a typo as "not very captain-y", Rosa finally confronts Amy about her snide comments. Rosa tells Amy to get in her car and not say another word, or she'll regret it. When Jake and Boyle arrive at Sal's Pizza, they try to distract the firemen at the scene. When Boyle manages to distract them, Jake looks around the scene. Fire Marshall Boone finds Jake, and soon the police officers and firemen are physically fighting each other. At the fire station, Holt apologizes for Jake and Boyle's behavior. When Jake still won't let the case go, Captain Holt wonders why Sal's is so meaningful to him. Jake explains that, when he was a young kid, his father was the coach of his little league team, and after every game he would take all the kids to Sal's Pizza. Boone is moved by Jake's story as his dad was absent during his childhood, too. Rosa drives Amy out to Ropesburg. As she shows her around the police station, Rosa tells Amy she's giving her the chance to take the job, since she wanted the offer so badly. Rosa introduces Amy to the deputies, explaining that Amy is one of their best cops and is interested in the job. When Amy asks why the last chief left, she learns he left to run a carpet cleaning business as he didn't want to be Captain of the most boring place on earth. When Captain Holt asks Terry and Gina who he should hire as the new IT director, Terry goes through the list of applicants. Gina dismisses all of them, giving common sense reasons why they wouldn't fit in at the Nine-Nine. Gina suggests they should turn their greatest weakness into their greatest strength by hiring Savant, the guy who hacked them. At Fire Marshall Boone's office, he hands Jake and Boyle the case file. When he sees that a cabinet was forced open before the fire, Jake realizes that Sal's secret recipe was stolen. Later, Jake, Boyle and Boone go to Gino's Pizza to arrest him. Gino stole the recipe to improve his sauce, which is why Boyle liked it so much last time when he had previously rubbished it in his email blast. Meanwhile, as Amy and Rosa drive back, Rosa tells Amy that it was not a good job, so there's no reason for Amy to be jealous. Amy apologizes, saying she can't help being competitive after growing up with seven brothers. Back at the precinct, Savant helps Hitchcock with his computer. Terry tells Savant he's part of the Nine-Nine now, where they look after each other, before threatening to destroy him if he does anything to harm the precinct. When Captain Holt tells Jake that Fire Marshall Boone called to say he should check his desk drawer, Jake opens it to find the drawer full of shaving cream. Later, at the fire station, Jake and Boyle retaliate by placing a paddling pool filled with Sal's pizza sauce at the bottom of the fire pole.